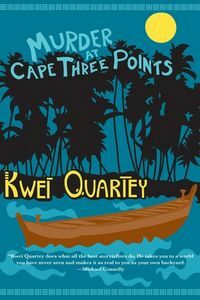 Murder at Cape Three Points by Kwei Quartey, a Mysterious Review. Review: Four months after the brutal murders of an oil company executive and his wife, with no progress made by the local police in solving the crimes, police inspector Darko Dawson is assigned to travel from Ghana's capital of Accra to the coastal city of Takoradi to lead the investigation, in Murder at Cape Three Points, the third mystery in this series by Kwei Quartey. Dawson is reluctant to leave his home, as his son has just been released from the hospital following heart surgery. But a promotion — and maybe his career — depends on him taking on this politically sensitive case. He finds that the local authorities have conducted a competent, if not always thorough, investigation but have come up with no credible suspects. Anyone who might have had a reason to kill Fiona and Charles Smith-Aidoo — and there is no shortage of people who aren't all that upset they're dead — have rock solid alibis. But Dawson is reluctant to consider the alternative, juju, supernatural powers believed by some of the local residents to have been responsible. Murder at Cape Three Points is a well-crafted mystery presenting Darko Dawson (and the reader) with several motives for the couple's murder. Both were ambitious in their respective fields, and both had made enemies. Still, Dawson believes their killing was not a random act, and was personal in nature. He methodically goes through the suspects' statements, interviewing them personally, and eventually deducing who the killer is. All well and good. But what is largely missing here is the rich texture and vibrant color of the region, especially once the story gets underway. With few changes, this mystery could just have easily taken place in Louisiana or Brazil as in Ghana, with local fisherman and off-shore oil platforms competing for resources of the ocean, and businessmen trying to displace long-time residents from their coastal homes to develop the land, the clashing of modern progress with traditional ways that is increasingly common everywhere. A solid story set in what sometimes feels like a generic location is an opportunity lost to transport readers to a part of the world they most likely will never see. Acknowledgment: Soho Press provided a copy of Murder at Cape Three Points for this review.